What a big event! 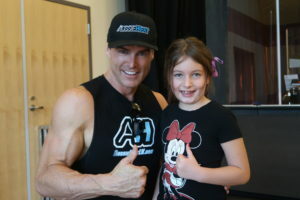 Las Vegas entertainers can always be counted on to assist charity events and they also included the event celebrity hosts Aussie Heat (Planet Hollywood), as well as celebrity guests. Not only did the star magician David Goldrake of “Imaginarium” (Westgate) attend, but Mariama Kouyate, dancer/contortionist/aerialist, and Max Torandell, dancer/ aerialist both in David Goldrake’s show. Jennifer Romas the producer/ star brought several dancers from “SEXXY” (Westgate), Stoney’s Rockin’ Country, dancer Ryan Johnson (“Cirque Du Soleil” — “The Beatles LOVE”), Edwin San Juan — “Las Vegas Live Comedy Club” — V Theater (Planet Hollywood) and more. The excitement began when the celebrities performed numbers from their acts, a great way to see the shows around Las Vegas and the cost was only $15. The cast of “Aussie Heat”, known as the highest rated male revue, hosted and participated in the activities with the Opportunity Village (OV) dancers, Adam Barr, Lenny Trae (choreographer who teaches lessons to (OV), Jayden Brown (danced alongside OV dancers with Lenny), Ben Forbs, Simon Farrow, George Blick (conducted line dancing lesson as well). 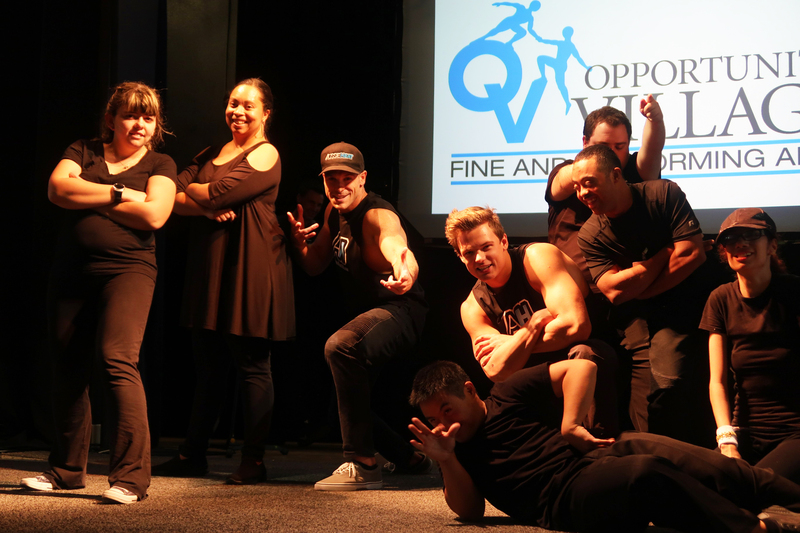 Aussie Heat produced an entertainment industry showcase, The Vegas Variety Show, to benefit Opportunity Village’s Fine & Performing Arts Program. The event’s featured entertainers performed acts from their headlining shows, spanning across several genres including dance, magic, comedy, music and more. Other celebrities included Emily Yates Blick, singer in Tony & Tina’s wedding (BALLYS), Ryan Johnson (body percussionist/tapper) And the OV Dancers: Lauren W, Chris P, Max R, Vanessa S, Kim D and Reese M.
The cast of Aussie Heat was inspired to develop this event through their relationship with Opportunity Village, where they conduct monthly hip-hop dance lessons to individuals in the performing arts program. The inaugural variety show featured performances by individuals in Opportunity Village’s Performing Arts Program, along with local talent who perform throughout Las Vegas in shows and venues. Opportunity Village is a not for-profit organization that serves people within our community with significant intellectual disabilities, to improve their lives and the lives of their families. Opportunity Village Ralph and Betty Engelstad Campus is located at 6050 S. Buffalo Dr., Las Vegas. Nevada’s largest employer of people with disabilities, Opportunity Village serves nearly 2,000 individuals annually, providing vocational training, employment, rehabilitation and social recreation programs and services that make their lives more purposeful and interesting. AUSSIE HEAT” is recognized as the most interactive male revue in Las Vegas, the Australian-based show Aussie Heat is comprised of eight classically trained dancers in street, break and hip-hop dancing. As seen on Australia’s Got Talent and So You Think You Can Dance Australia, the group takes male revue to a whole new level. Aussie Heat explodes with interactive seduction and world-class choreography, performing four nights a week at the V Theater inside Miracle Mile Shops. Tickets to the electrifying show start at $54.99 (plus applicable tax fees) and can be purchased online or at the V Theater Box Office. For more information, visit www.aussieheatlv.com. Next story See something, say something… but to whom?